At Tudor Oaks, we promote active senior living through a variety of scheduled events and activities for residents. We recognize that along with offering amazing services and amenities, providing social, educational, physical and spiritual activities is vital to maintain mental and physical health so you can enjoy all life has to offer. 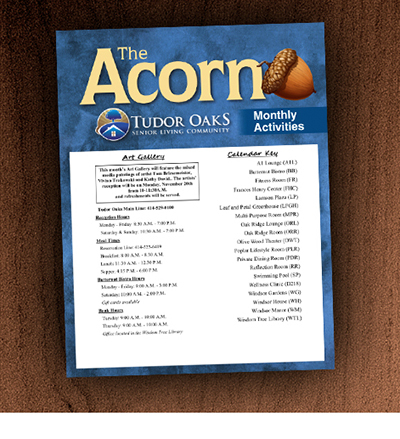 Click on one of the community calendars below to see a PDF calendar of our upcoming senior living community activities and events, or to read The Acorn, our monthly activities calendar publication, click on the Acorn graphic below.